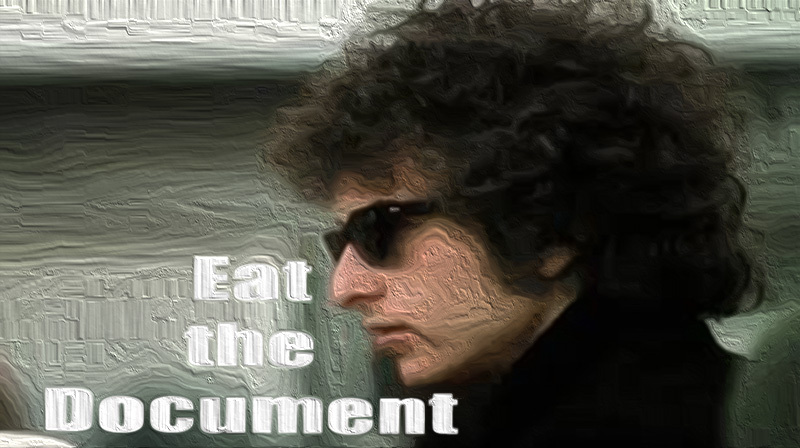 Eat The Document premiered at the New York Academy Of Music, February 8, 1971. 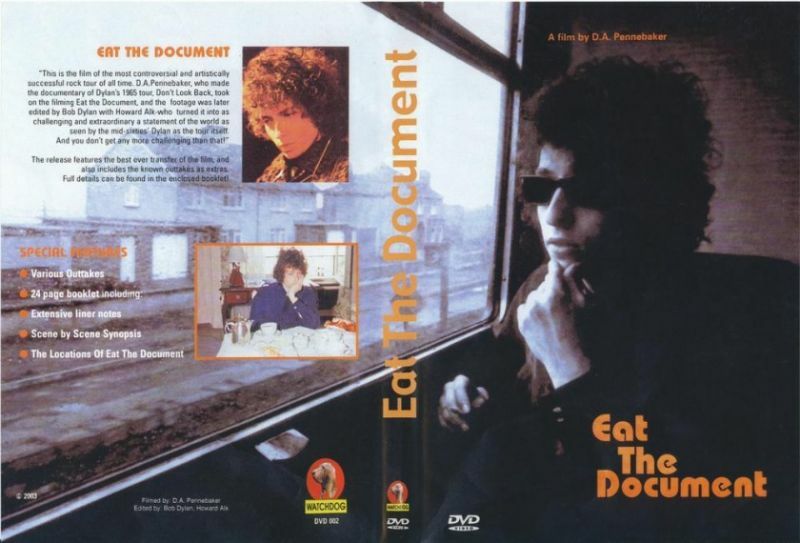 Eat the Document is a documentary of Bob Dylan’s 1966 tour of the United Kingdom with the Hawks. It was shot under Dylan’s direction by D. A. Pennebaker, whose groundbreaking documentary, Don’t Look Back, chronicled Dylan’s 1965 British tour. The film was originally commissioned for the ABC television series Stage ’66. Other scenes include Dylan and Robbie Robertson in hotel rooms writing and working through new songs, most of which remain unreleased and unpublished. Among these songs are “I Can’t Leave Her Behind”, which was later covered by Stephen Malkmus for the I’m Not There soundtrack. The film also includes a piano duet with Johnny Cash performing Cash’s “I Still Miss Someone”. I do not find this nearly as entertaining as Don’t Look Back, but it is still fascinating. What I marvel at is the music of Dylan/Hawks 1966 tour sounds so unlike any comparable live music from anyone else at the time. So incredible…and so far ahead of its time. It would be several years before anyone else would catch up. O how I wish for a high quality version in my lifetime! What is the hold up? To see it all in its glory. To see every mind polluting detail clearly. Come on, people! How can anything be more important? I remember this well. I left work from my dad’s printing shop to be sure that I would get in if it sold out. I was second on line with A.J. Webberman third. He talked my ear off until the box office opened. As it turned out, I don’t think there was more than a few dozen fans there for the premier showing of the movie. Still one of my favorites, so I hope they release it on DVD soon. I’m not getting any younger! Thanks for your story, great! bluray release please, anyone, someone!